The parado x of a good inspirational wisdom book is that the moment you finish a page or two, you are compelled to put the book down, to stop reading and just live life. And what about a good wisdom book—on writing? It screams through its implications—throw me down! Why are you even reading me right now when you could be living the life of the writer? The book consists of quotes by mostly well-known authors, along with Moore’s accompanying commentaries. The passages are grouped into four chapters: “The Writer’s Mind,” “The Writer’s Desk,” “The Writer’s Vision,” and “The Writer’s Life.” The grouping is loose, and yet many of the quotes and commentaries do lead rhetorically one to the next. As is the case of many little books of quotations, the most enjoyable way to read is to open the book to a random page and take in a little gem before starting the day. While a few of the authors may not be readily recognized, most are prominent names—Faulkner, Mann, Kingsolver, Carver, Rilke, Carruth, O’Connor, Ginsberg. Some are Buddhist writers such as Thich Nhat Hanh and Pema Chödrön, but more often they are poets, lyricists, and fiction writers from the secular arena—voices from a wide array of backgrounds and genres. Though none mentions the term mindfulness, they all seem to point, from their individual vantage points, to this fundamental truth. This unity and coherence is due to Moore’s thoughtful ordering of the pieces as well as his reflective, personal commentaries, often humorous, and always relaxed. You have to go to considerable trouble to live differently from the way the world wants you to live. That’s what I’ve discovered about writing. The world doesn’t want you to do a damn thing. If you wait till you got time to write a novel or time to write a story or time to read the hundred thousands of books you should have already read—if you wait for the time, you’ll never do it. ‘Cause there ain’t no time; world don’t want you to do that. World wants you to go to the zoo and eat cotton candy, preferably seven days a week” (135). The world conspires against us to keep us from our desks. Any writer will know this already. And yet this confirmation from both Crews and Moore can be a relief. You, writer, are not alone in this. Yes, it is an uphill battle. The world screams, Zoo! Cotton candy! Moore adds, Football, and Aunt Bessie wanting you to visit (136). And who among the demanding world will understand when you say you cannot go, that you must “stay home to work on your poems or stories” (136). Writers, Moore says, are sometimes held in low esteem. Yes, this is true, and yet Crews and Moore encourage us to not wait for permission. They encourage us to go ahead and live the life we imagine for ourselves. Their voices, combined, help us to smile at our lot in life, and then live it, take it on, knowing that we are all in this solitary act of writing together and that the only permission that matters is the permission we give ourselves. Like the person who tries meditation for the first time and then says “Never again” because he couldn’t stop his mind from speeding, some may avoid writing because it seems like such hard work, because those early sentences and pages all seem like clunkers. But if we run from initial—and protracted—discomfort, we run from the very thing we should be running toward—that is, if we truly wish to be writers. In his commentary on Bradbury, Moore tells his story of a failed book. After four years of devotion, after 1,200 pages, 360,000 words, and revision after revision, Moore, with the help of his honest agent, came to the realization that the project could not be resolved and needed to be put down—abandoned. Four years! 360,000 words! For what? “Kill your darlings” (110), William Faulkner says from these pages. And yet you love your darlings. Your attachment to them is what makes them darlings in the first place. Though this book is full of inspirational moments, Moore and his chosen authors do not flinch when addressing the difficulties writers face. They are dreamers, of course, and yet they are also realistic about how truly difficult it can be to express dreams clearly and make them interesting for others to read. Luckily, there is a silver lining to this unflinching look at hardships. In Moore’s case, he put his failed book aside, and the moment he resigned himself to the way things were, he felt a great release and freedom to follow new opportunities. He opened himself to a new beginning, and this opening led to the next chapter in his life—a book he is proudest of in his career. Ultimately, in this little book on writing, Moore shares the fundamental lesson of life. Writing, after all, is just a specific form of living. Living—and writing—with consciousness, with awareness, with mindfulness, we can learn to see our attachments to the darlings and practice loosening our grip, opening our hand, and letting go when necessary. This is the way of being “fully alive, fully human, and completely awake” that Pema Chödrön speaks of, and to live in this way, Chödrön says, “is to be continually thrown out of the nest” (134). Moore adds that this being fully alive means feeling every moment of existence. In his first book on Buddhism, The Accidental Buddhist: Mindfulness, Enlightenment, and Sitting Still (1997), Moore takes us on a journey of self-discovery as he explores the landscape of Buddhism in America. In this earlier book, we benefit from Moore’s complete lack of experience. He plays the role of the charming, humorous, well-intentioned, yet slightly bungling newbie, learning as he goes. The insights of the book spring up inductively at the conclusion of his explorations. 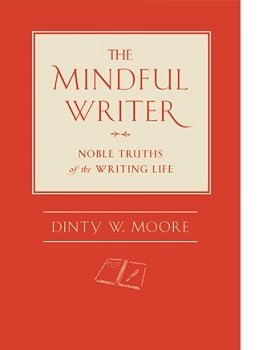 In The Mindful Writer, however, we benefit from the voice of experience, from Moore’s many years of hammering away at the anvil of the writing desk—and from his fifteen years of Buddhist practice since his journey in The Accidental Buddhist began. Fittingly, the messages of the two books are really the same. The practice of life—and of course, of the writer—is about right now—doing what needs to be done, with presence. If just sitting needs doing, just sit. If just writing needs doing, just write. If just being with family needs doing, just do that. Nothing could be simpler than this message. We don’t need a pretty little red book to tell us this, do we? And yet maybe we do. In this world of ready distractions, in a world which seems to have conspired against the writer, in a world of dusty floors, children crying, eternal stacks of papers to grade or reports to write or grass to mow, a little red book of wisdom which speaks out one singular wake-up call may be just what we need to keep us on the straight and narrow. At least I could use a reminder once in a while—a finger pointing to the moon, or at least back to my writing desk.